Every USI branch has expertise in local building science for their region. These experts know how our unique installation solutions contribute to increased energy efficiency and a properly sealed building envelope. By sealing the building envelope and installing proper insulation, not only can you control the temperature regulation of a building, but the air quality can be preserved. 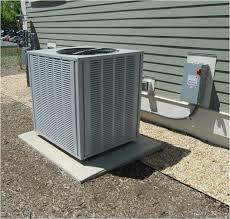 In addition, having a continuous and fresh air supply helps to improve the air quality and overall comfort. Here are some things you should to know about improving air quality for residential and commercial buildings. 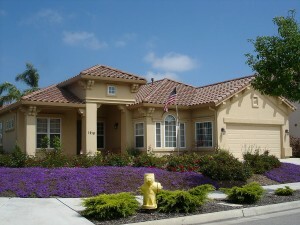 Architects often consider the aesthetic flow of a home when they design. The structure of the home can also affect the flow of heat and air. Smart choices can lead to lower energy bills and a very comfortable home. 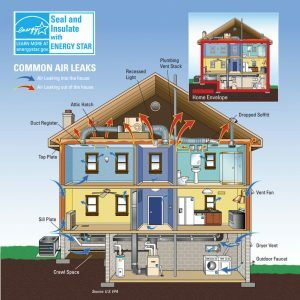 The design of a comfortable home has long depended on air flow. In cold climates where heat came from fireplaces, homes were designed with many rooms that could be closed off so that the heat could stay in the main living areas. In warm climates like Hawaii, homes have multiple doors that open on all sides to allow a cross-breeze to naturally keep things cool. As upgrades have been made in insulation and central heating/cooling, open floor plans have become more feasible without compromising air flow. What we are normally concerned about is ACHnat, which stands for Air Changes per Hour that “naturally” happen in a house. A lot of the numbers you will see are based upon the house under a set pressure. Those can be used to come up with the ACHnat number. Pat Dwyer, Branch Manager at USI Champion Insulation in Houston, TX, says that “for a normal batt and blow house, ACHnat is usually around .5. That means that every hour, half the volume of the air in the house leaks out to be replaced by air from the outside, like from the garage and attic. This air will have a lot of humidity and particles in it – whether pollen, dirt, heat (attic) or CO from the garage. The air handler now needs to try to dehumidify, cool and clean that air as it pulls from the returns. So .5 ACHnat means that 12 times the volume of your house in leakage has to be treated each day on top of the heat that is making its way into your house from radiant and conduction heating. Think of the difference in the volume of moisture and contaminates between a batt house at 12 x the volume vs. 2.4 with foam each day. The air conditioner in the batt house has to work at least 4 times as hard. Some people always ask about the fresh air vents we put in houses in which we install spray foam insulation, and how that is different than air leakage. The big differences are: 1) we pick where the air comes from – soffit vs. attic or garage 2) that air is introduced into the return before the coils and is filtered and conditioned before it enters the house and 3) having a fresh air intake helps to put a positive pressure on the house, which keeps pollen, dirt, and hot air from leaking past doors and windows. The quality of the air in your home can have a big impact on your health. Poor air quality can set off allergies and sinus problems. It’s especially problematic for people with respiratory illnesses such as asthma. There are several steps you can take to ensure that your indoor air quality is good. Sometimes homeowners are directly responsible for polluting their own indoor air. One of the worst culprits is smoking, which makes the air toxic. If there are any smokers in your household, make sure they go outdoors to indulge. There are also other, less obvious sources of indoor air pollution. These include air freshners that contain harsh chemicals, scented candles, incense and smoke from woodburning stoves. Being aware of what you burn and spray in your home is the first step towards developing healthier habits. By sealing off the eaves and encapsulating the attic roof deck, this allows the hot air from outside of the home to stay outside and the air conditioning to work less by staying cool in the attic space. The walls can be sprayed to close up all the exterior gaps and penetrations that were created during the building of the home and also to keep the heat from penetrating through the walls. By creating this sealed envelope, a house will be air tight, which cuts down the chances of mold growth significantly. Without air transfer from hot to cold there is less moisture, therefore less of a opportunity for mold to grow. During USI’s initial inspection of a job site, we check for how well ventilated the space is and what pre-installation prep work needs to be done. Ventilation is a necessary component of any home, especially with how many functions modern HVAC systems have. A good ventilation system will keep the inside environment ventilated, heated, cooled and humidified depending on the homeowners preference. Whole-house ventilation systems, in particular, can affect indoor air quality on a larger scale than local ventilation systems, which may not be as advantageous for a larger living space. Whole-house ventilation systems use one or several duct systems and linked fans to get rid of stale air and supply the home with fresh air. All of the air cycled through the home is processed through filters that are designed to pick up unwanted contaminants and prevent them from cycling around. 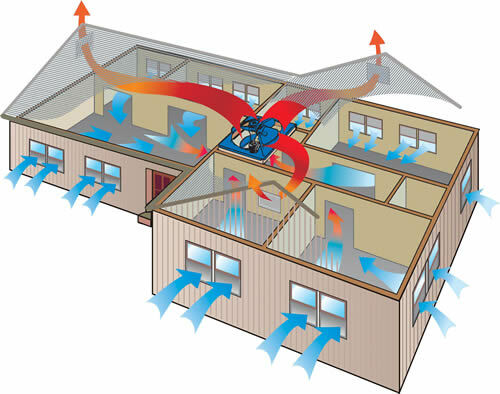 Whole house ventilation is advantageous for larger buildings and structures because the entire system functions to keep indoor air desirable in every room of the home. Separate duct zoning systems may require special filter care, but ultimately these systems are ideal for use with larger environments, especially ones that need to be maintained at different comfort levels depending on use. Local ventilation systems, on the other hand, affect indoor air quality on a smaller scale. These are often limited to a single room or set spaces, which makes them much more affordable and easier to install and maintain. However, because of the smaller area affected by these installations, they are not ideal for larger environments unless they are installed in each individual room. Local ventilation systems are ideal for smaller spaces such as studio apartments, as they can provide individuals with better indoor air quality for their special needs. If we’re talking about a commercial building like an office space, make sure that it is a non-smoking zone. This is critical not only in reducing fire hazards, but also reducing the presence of airborne pollutants. Ash and cigarette smoke could stain walls and upholstery, resulting in a permanent and unpleasant scent. By removing the presence of such chemicals immediately, you can save on future cleaning costs while keeping your workplace pleasantly clean.